Caprese: smoked buffalo mozzarella by Azienda Raffaele Barlotti, tomatoes and aromatic herbs (La Caprese: mozzarella di bufala, bufalina affumicata dell'Azienda Raffaele Barlotti, pomodori ed erbe aromatiche). Sweeet panino with gianduia cream, Formigine cow ricotta, chocolate shards and Maldon salt (Panino dolce alla crema gianduia, ricotta di vacca di Formigine, scaglie di cioccolato e sale Maldon). 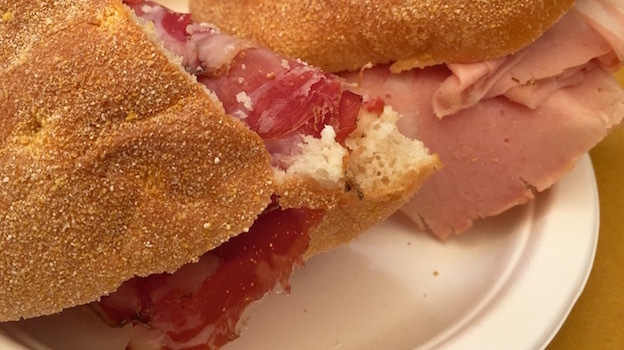 Italy’s best sandwich stop opened on December 7, 2013. It’s safe to say that its owner and clientele have never looked back. 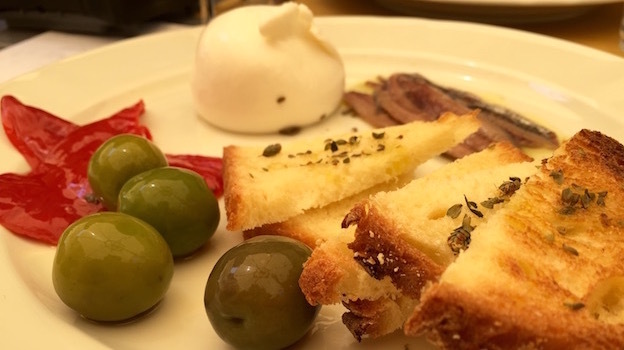 The brainchild of Giuseppe (“Beppe”) Palmieri, Generi Alimentari da Panino (or Panino, for short), this small dining spot is located just a stone’s throw away from super chef Massimo Bottura’s Osteria Francescana. Palmieri, who just happens to be the head sommelier and maître of the Francescana and the perfect complement to Bottura, is a true numero 1 when it comes to great food and wine. Sybarites everywhere owe him endless thank-yous for having created this little alimentary jewel. It really is little, with more or less 10-12 seats in all. On most days I go there (which is as often as I can) there are crowds of people who can’t get in and so just happily convene eating outside while leaning up against the building walls or sitting around on makeshift seats. The place is a veritable treasure trove of fantastic ingredients that are used to make, you guessed it, panini (sandwiches). Admittedly, these are creations that put the good old peanut butter and jelly sandwich of halcyon childhoods to shame (independently of how good or not it may have been: after all, there’s no accounting for childhood memories). The ingredients used read like a who’s who of Italy’s best gastronomic nuggets: dark red cherries (amarene brusche) from Modena, smoked buffalo mozzarella from the high quality Raffaele Barlotti estate in Paestum, the mozzarella purveyor to the stars (chefs: Italian superstar stove men such as Gennaro Esposito and Davide Scabin all choose his products), the anchovies from Cetara by Pasquale Torrente, generally recognized to be of non-pareil quality, and the bread from Matera baked at Pane e Pace, an oven owned by the Perrone family which boasts more than 100 years of bread-making history, as well as the use of high quality grains such as the Senatore Cappelli (which is also used to make an outstanding, if admittedly tough to cook and get just right, pasta) and what is arguably the best mortadella in the world, produced by Favola Palmieri located in San Prospero near Modena, the only producer to keep the mortadella wrapped within the original pork rind, thereby locking in its fragrance and juices to the utmost. All of the ingredients are then intelligently mixed together to make for some exciting and savory Panini experiences, and I had a hard time picking a favorite on this particular day. Wines at Panini are ideally chosen for the food, so lots of bubblies, that help wash down the numerous salumi-based sandwiches, are available. The NV Jean Vesselle Champagne Reserve Brut is an 80/20 Pinot Noir and Chardonnay blend. Not surprising given that Vesselle’s happy playground is Bouzy, well known for outstanding Pinot Noir grapes, it really stands up to the meat-based panini. 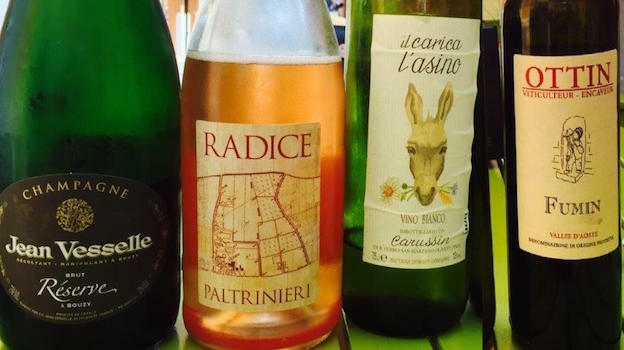 Here, at Panini, Palmieri selects a lineup of special wines from high quality producers and labels them with his own Glocal brand; these may be the same as the regular bottling, or may be tinkered to Palmieri’s specifications. 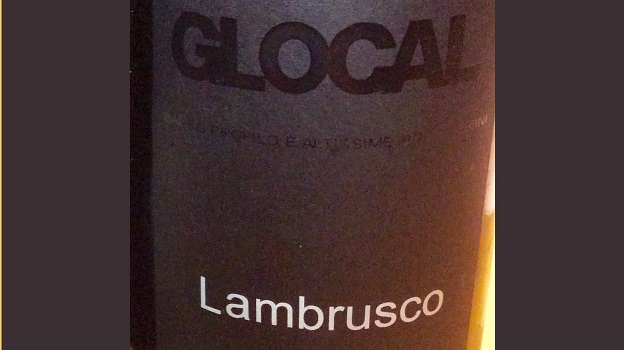 For example, the NV Paltrinieri Lambrusco di Sorbara Radice is usually available under Palmieri’s Glocal label, and is always a standout. Delicately pink and redolent in strawberry aromas and flavors, long and beautifully precise, it puts to shame all the bad Lambrusco wines you may have endured during university days. I always find it a thrill to taste the 2014 Carussin Vino Bianco Il Carica l’Asino, a rare white wine made with the even rarer Caricalasino grape variety. In truth, Caricalasino is a name given to a number of different, unrelated, grape varieties in Italy, all of which are capable of producing lots of grapes (hence the carica l’asino, or “load up the donkey” moniker). Carussin’s version is the best of a lot, herbal and lemony offering sneaky concentration and plenty of savory flavors. Last but not least, the 2014 Ottin Fumin Valle D’Aosta is a steal. Ottin’s version is inexpensive and delicious, and is a textbook example of what this little known northern Italian native grape can give in the hands of a talented producer. Fumin is known for not always reaching optimal phenolic ripeness (and hence is sometimes marred by a green streak), but when it basks in the warm sun of a long growing season it delivers a delightful, medium bodied wine not unlike a delicate northern Rhône Syrah, with aromatic herbs, violet, and flint nuances galore. The wines at Panino are a great complement to the hearty food; like the ingredients used, they are first rate and well chosen. 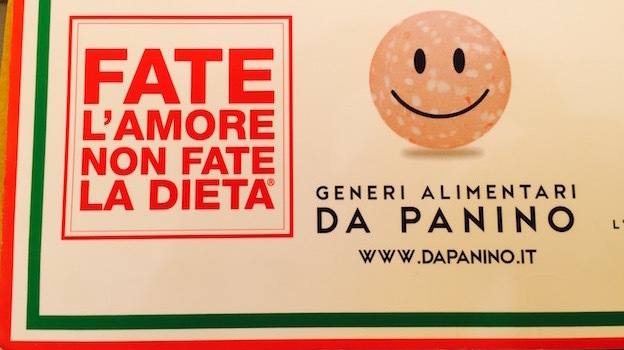 Molto bravo davvero, Signor Palmieri.